We’re all feeling the cold right about now in the Pacific Northwest – and the rest of the country too. But here at Point Defiance Zoo & Aquarium, our animals have some pretty cool ways to deal with it. From fur coats to heated hammocks, here are five ways our animals beat the winter cold. Visit in summer, and you’ll see our Arctic fox Maggie with brown fur. But come winter, she’s grown a lush, thick mantle of pure white. 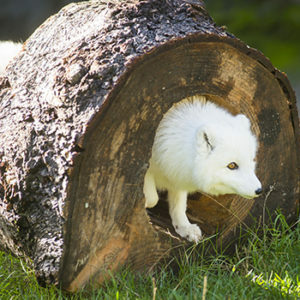 Arctic foxes live in the treeless tundra of Arctic Eurasia, North America, Greenland and Iceland. While they dig burrows and store summer food to survive the chill winters, they still need extra warmth – and camouflage against the snow. A white coat? Perfect. Meet our Arctic fox in the Arctic Tundra habitat. Humans long ago discovered that wearing a layer of wool under your clothes keeps you extra warm. For muskoxen, that layer grows automatically. Called qiviut (“kiv-ee-ute”), this soft underwool grows every winter. It’s warmer than sheep’s wool, softer than cashmere – and sheds every spring with a shaggy look. Our muskoxen Mya, Hudson and Charlotte all sport qiviut during the winter. 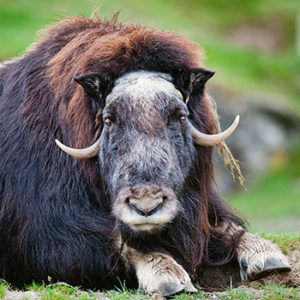 Meet our muskoxen in the Arctic Tundra habitat. A lot of us eat more in winter – but if you’re a polar bear, putting on an extra few inches of fat is a good thing. Polar bears hunt throughout winter, and to survive Arctic temperatures they need a four-inch layer of blubber under their skin. The best diet for this? Fresh seal, found just off the ice. But they’ll also eat walruses, belugas or other whales that have washed ashore. Blizzard and Boris, our polar bears, have an extra advantage – a behind-the-scenes sun porch to soak up those rays! 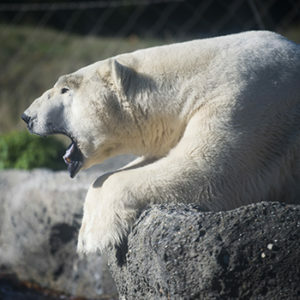 Meet our polar bears at Keeper Chats, 11:30am daily in the Arctic Tundra habitat. All our outdoor animals also have an indoor living area where they can spend cold or wet days. 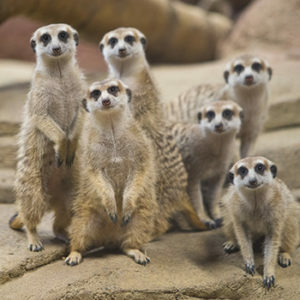 Some – like the meerkats and lemurs – have radiant heaters outside, to ward off the cold. But meerkats, which are native to the Kalahari and other southern African deserts, have a natural way of coping with cold. Digging elaborate systems of tunnels over three feet deep, they cuddle up at night in cozy groups. On cold days, spot our meerkats darting in and out of their tunnels inside at Kids’ Zone. 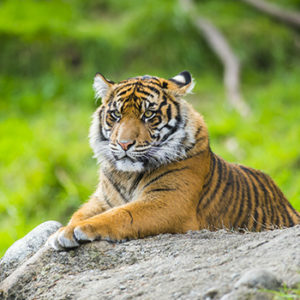 Our Sumatran tigers love sunning themselves on the big central rock in the largest Asian Forest Sanctuary habitat. But it’s not just because the view is great. That rock also happens to be heated – perfect for a species that hails from Sumatra, the biggest island in tropical Indonesia. Other habitats have heated, covered hammocks for our gibbons and siamangs, which the tigers like to lie underneath when it’s their turn in that space. Luckily for visitors, the hammocks are right by the windows! Meet our tigers, siamangs and more at Keeper Chats, 12:30pm daily in the Asian Forest Sanctuary habitat.